Did Chewing Tobacco Kill Tony Gwynn? On Monday, Tony Gwynn died from complications related to salivary cancer, the same disease that claimed the life of Beastie Boy Adam Yauch two years ago. When Yauch died at the hospital where I work in Manhattan, I was shaken. A whole generation got a little older that day. The thing about Yauch's illness was that nothing immediately jumped out—was it tobacco? Alcohol? Human papillomavirus? Why did he get cancer? No one really knew. But for Gwynn, the answer appeared to be straightforward: The former Padres star believed his cancer was caused by years of using chewing tobacco. But was he right? Before we dig into cause and effect, it's important to know a bit about facial anatomy. Humans have three main sets salivary glands: the parotid, submandibular, and sublingual glands. (There are also about a thousand minor glands located throughout the mouth, but leave those for another time.) Tony Gwynn reportedly suffered from a malignancy of the parotid gland, which is the most frequent salivary tumor site, accounting for approximately 85 percent of these cancers. It makes sense that Gwynn attributed his illness to chewing tobacco—the stuff is known to contain toxins that trigger cancer of the lip, tongue and mouth—but as any oncologist will tell you, chewing tobacco hasn't actually been linked to the type of cancer that killed Tony Gwynn.2 Loren Mell, chief of the head and neck radiation medicine service at the Moores Cancer Center in San Diego—and a consulting physician on the team that treated Gwynn—recently weighed in, dismissing Gwynn's assertion that chewing tobacco was to blame. "He may have chewed tobacco," Dr. Mell said, "but that's not likely to be the cause." So if it wasn't chewing tobacco, what was it? What did Tony Gwynn and Adam Yauch have in common? Why did they both die from the same obscure tumor? It turns out that salivary gland cancer is exceedingly uncommon—only a few thousand cases occur in the United States every year—which makes it difficult to conduct a trial to figure out exactly why it happens. "In the case of parotid cancers," Dr. Mell said, "there's not a single, unified cause that's identified." So while blaming Gwynn's disease on chewing tobacco makes intuitive sense, it's important to know that there isn't any firm medical evidence to actually support the claim. But some physicians suggest it's silly to wait for science to play catchup with what seems so obvious. "For several of my patients, if they chew tobacco on one point of the mouth, that is the part of the mouth that develops cancer," Dr. Krzysztof Misiukiewicz, assistant professor of medical oncology at Mount Sinai, recently said. "It's proof that direct contact matters." It's true, direct contact certainly could be harmful. The one time I tried chewing tobacco, it felt like* there were tiny shards of fiberglass cutting the inside of my lip, allowing nicotine and all of the other toxins to enter my body more quickly. It's not hard to imagine a scenario where this leads to cancer, but at this point it's just a theory. Like the link between brain trauma and CTE, we don't have hard scientific evidence associating chewing tobacco with salivary cancer, just suspicions. But unlike that disease, we have leads on other risk factors and contributing causes to turn our attention to while the science sees itself through. And to blame this complicated cancer solely on chewing tobacco misses the mark, because there's far more to this story. There's no predominant risk factor associated with salivary gland cancer, but a number of things have been implicated. Based on data from atomic bomb survivors in Hiroshima and Nagasaki, radiation exposure was identified as a risk factor for the development of both benign and malignant salivary gland tumors. Viral infections—including human immunodeficiency virus (HIV), Epstein Barr Virus (EBV), and human papillomavirus (HPV)—have also been associated with an increased risk of salivary gland cancers. But without looking at Gwynn's chart, it's impossible to say if any of these conditions actually played a role in his disease. There are also some random environmental risk factors to consider. Exposure to rubber manufacturing, hairdressers, beauty shops, and nickel compounds carry an increased risk of developing a salivary tumor. But realistically, these things probably weren't responsible, either. The most likely scenario is that both Tony Gwynn and Adam Yauch were the victims of bad genes, not bad habits. Salivary tumors tend to result from sporadic genetic defects in tumor suppressor genes like BRCA or oncogenes in the Ras family, or from an aberrant biochemical process called translocation, where chromosomes randomly swap parts of their DNA. These mutations can activate genes that affect cell growth, like human epidermal growth factor receptor 2 (HER-2), which is overexpressed in a particularly aggressive and lethal form of salivary cancer. This is important, because the gene is also expressed in certain forms of breast cancer, and one day there may be an opportunity to treat salivary cancer with some of the drugs we currently use for breast cancer. But we're not there yet. Which brings us to the frustrating topic of treatment. One of the devastating realities about salivary cancer is that we don't really know how to treat it. In this age of personalized medicine, where new drugs are developed to inhibit rogue enzymes within tumors, we're still baffled by salivary cancer. Mostly, we just try to have it surgically removed, which is a fine approach if you catch it early, but many people don't. And that leaves patients and physicians scrambling. Gwynn ultimately underwent a wide range of treatments—facial surgery, radiation, and chemotherapy—but those were essentially Hail Marys once the cancer had spread to his facial nerve.3 His physicians did what they could, but their options were limited. The disease is so rare that there just aren't large, randomized trials to guide use when we attempt to treat advanced disease. 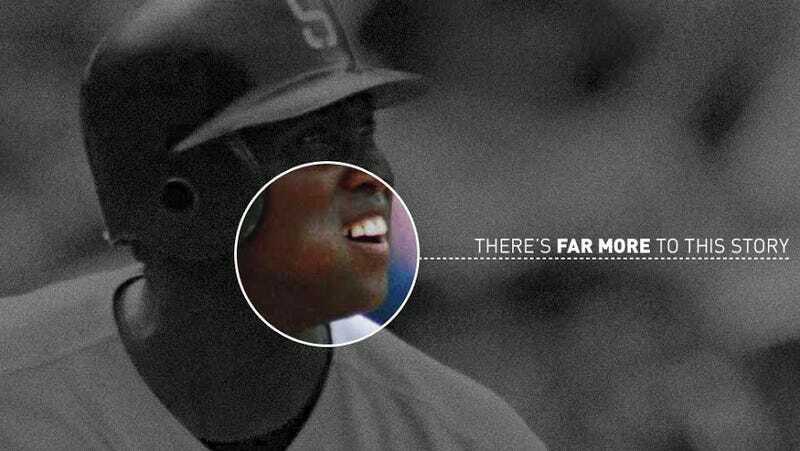 Whether or not chewing tobacco contributed to Tony Gwynn's death, he died the way so many do who use the product, having his face chopped at by surgeons who tried in vain to remove the tumor. Smokeless tobacco hasn't been firmly linked to the cancer that killed Tony Gwynn, but it's still deadly, causing cancer of the stomach, esophagus, pancreas, mouth, and throat. It's also thought to increase the risk of heart disease and stroke. (You can read all about the dangers of chewing tobacco here.) But if there's anything positive that might come from the Hall of Famer's passing, it's that Major League Baseball is once again facing calls to ban smokeless tobacco from games. Let's hope they do. Former Major League Baseball catcher and broadcaster Joe Garagiola was able to quit chewing tobacco and has spent the past few years using disturbing imagery to convince other players to do the same. "I tell these guys, 'You may not like what I say, but with lung cancer you die of lung cancer. With oral cancer, you die one piece at a time. They operate on your neck, they operate on your jaw, they operate on your throat.'" And that, sadly, is how Tony Gwynn died. 1 A number of conditions can cause swelling of the salivary gland, including cysts, stones, sarcoid, Sjögren's syndrome, and metastases from other tumors. Distinguishing among these possibilities usually requires a biopsy. The disease often starts out with a benign growth which can evolve into a lethal malignancy. This is presumably what happened to Gwynn. 2Warthin's tumor has a strong association with smoking, in contrast to other salivary gland tumors for which there is no clear relationship. 3 Survival rate drops once the cancer spreads to the lymph nodes, neck or facial nerve, and by the time the cancer spreads through the body, as it undoubtedly did with Gwynn, survival rates fall to the single digits.